Air strikes in northern Syria have killed at least 25 members of a prominent jihadist group, including senior figures, monitors say. 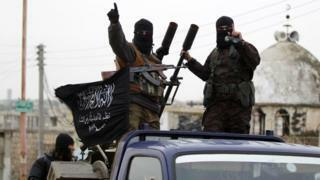 The UK-based Syrian Observatory for Human Rights says it is not clear who carried out the attack against the Jabhat Fateh al-Sham group, formerly known as Nusra Front. Russia and Turkey say the group is not included in a ceasefire deal in Syria. Meanwhile, rebel groups say they are halting preparations for peace talks. A statement signed by a number of groups cited "many big breaches" by the Syrian government and its allies as a reason. The ceasefire was brokered by Turkey and Russia last Thursday and has mostly held since then. Peace talks were planned for later this month in Astana, Kazakhstan. The Syrian Observatory said it could not determine if the strikes, in the countryside of Idlib province, were carried out by the US-led coalition or Russia. Among the dead were leading members of Jabhat Fateh al-Sham, which was holding a meeting there, the Observatory added, without identifying them. Many others were wounded, it said. Abu Anas al-Shami, a Jabhat Fateh al-Sham spokesman, said in a statement the attacks were carried out by the US-led coalition. "The headquarters targeted by the international coalition a short time ago are a main headquarters for that area and contains a number branch offices, leading to the killing of the brothers," he said in a statement quoted by Reuters news agency. Jabhat Fateh al-Sham changed its name last July and announced it was splitting from al-Qaeda. Members of the group are currently operating as part of a rebel alliance that controls Idlib province, the main rebel stronghold after eastern Aleppo was retaken by Syrian government forces last month. As well as the Jabhat Fateh al-Sham, the ceasefire deal excludes so-called Islamic State (IS) and the Syrian Kurdish Popular Protection Units (YPG) militia, according to the Syrian army, but the exclusion is disputed by the rebels.